As we observe Hispanic Heritage Month, we are reminded of the need to focus every single month of the year on the needs of historically underserved communities, including Hispanic and Latino students. While the educational achievement for all students in Michigan has been declining for the last decade, a look at the statistics for Latino students in Michigan is especially troubling. In 2003, Latino 4th graders in Michigan were ranked 16th in reading and 22nd in math among Latino students in all 50 states. As of 2015, our Latino students dropped to 33rd in reading and 43rd in math on the same national assessment. 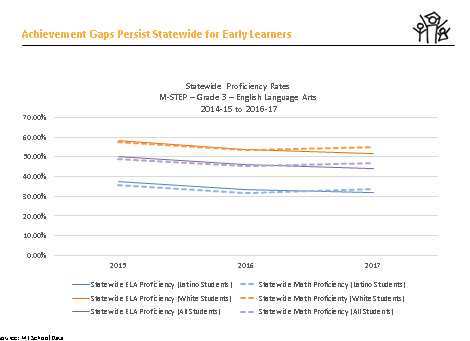 Michigan’s Latino students are not only falling behind peers in other states, they are facing a growing achievement gap with other students in Michigan. In 2016-2017, the statewide proficiency rate for Latino 3rd graders was 32 percent proficient, far below the statewide proficiency rate for White third graders, 51.7 percent, and for all third graders, 44.1 percent. If we want Michigan to prosper in the years ahead, we need to have all of students achieving at higher levels, including Hispanics and Latinos. 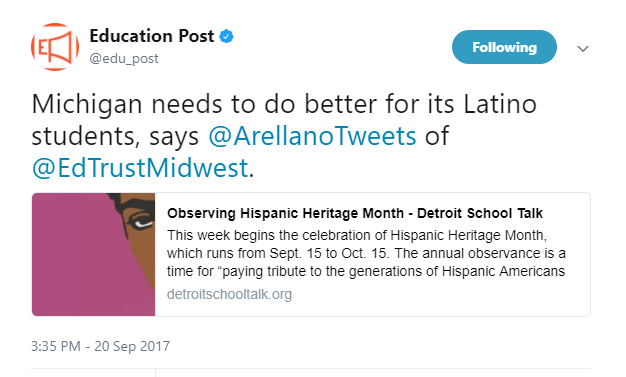 That would really give us something to celebrate during Hispanic Heritage Month. House Education Reform Committee meets Thursday, September 28 at 9am in room 521 of the House Office Building. Agenda: House Bill 4805 (Reilly – R), which would eliminate certain reporting requirements for home-schooled students; and HB 4735 (Miller – R), which would permit dual enrollment at certain out-of-state post-secondary education institutions that are near the Michigan border for students attending school near the Michigan border with another state.